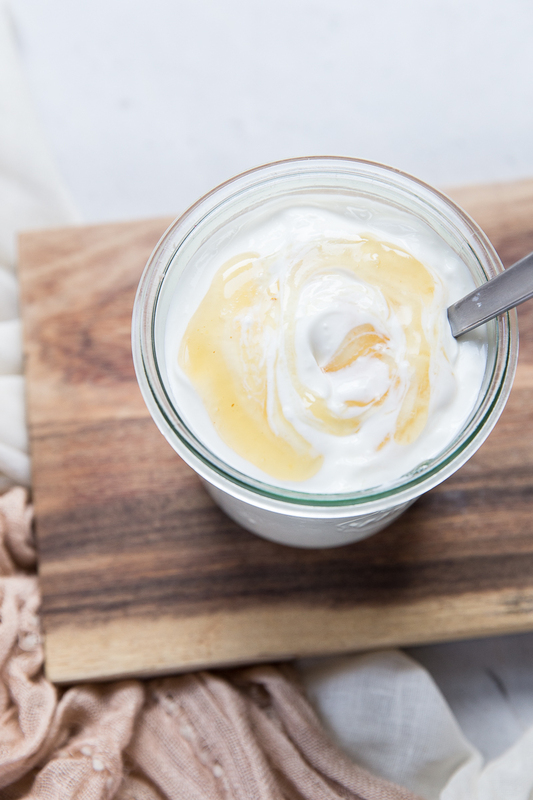 This Homemade Greek Yogurt Recipe is made in an Instant Pot and is positively irresistible. 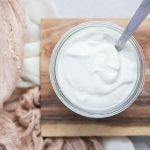 My Instant Pot yogurt recipe is simple and produces a thick and creamy yogurt better than store bought and without any processed ingredients. If you have an instant pot, you simply must be making your own yogurt! About five years ago I started making my own homemade yogurt. No yogurt maker, just milk and yogurt culture and I would make a batch to enjoy all week long. My vanilla bean yogurt recipe was easy and so much better than anything you could get at the store. A few years, and a few kids later, we’ve found ourselves eating more and more yogurt so I needed to find a way to make bigger batches of yogurt for the whole family. Around the same time as my second kiddo started eating yogurt, the Instant Pot came on the scene. While a lot of people are getting the instant pot for a lot of different reasons, my primary reason was for making big batches of homemade yogurt. Making yogurt in the Instant Pot not only saves a lot of money over time, it also makes a creamier, more pure yogurt without any additives like preservatives. And once you get the simple steps down you’ll be making it once a week as part of your normal routine. • This recipe has 4 main steps. While many other recipes I’ve found out there tend to complicate things I hope you find this process to be easy. The steps are as follows, 1) boil the milk, 2) cool the milk to 112 degrees and then add the starter, 3) cook the yogurt for 8 hours, then 4) strain the yogurt and refrigerate overnight. • I’ve found that starting the process no later than 11am works best so the yogurt is strained and ready to refrigerate overnight before I go to bed. • A half gallon of milk will make almost 2 pints of Greek yogurt. A full gallon will make 3 1/2 to 4 pints of Greek yogurt. For either measurement I use one packet of yogurt starter for the full amount. 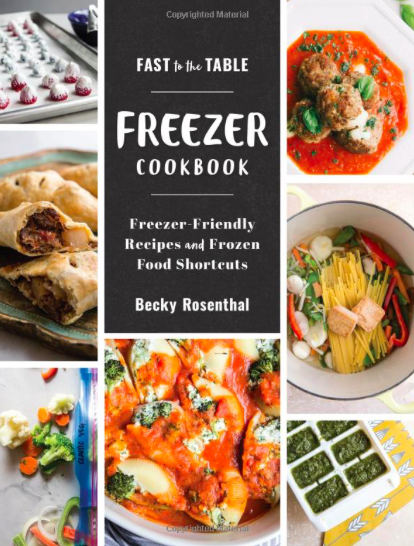 • I use a yogurt culture to ensure that the yogurt gets the full amount of probiotics and firmness but you can also use a 1/2 cup of plain greek yogurt instead of using a the freeze-dried powder culture. 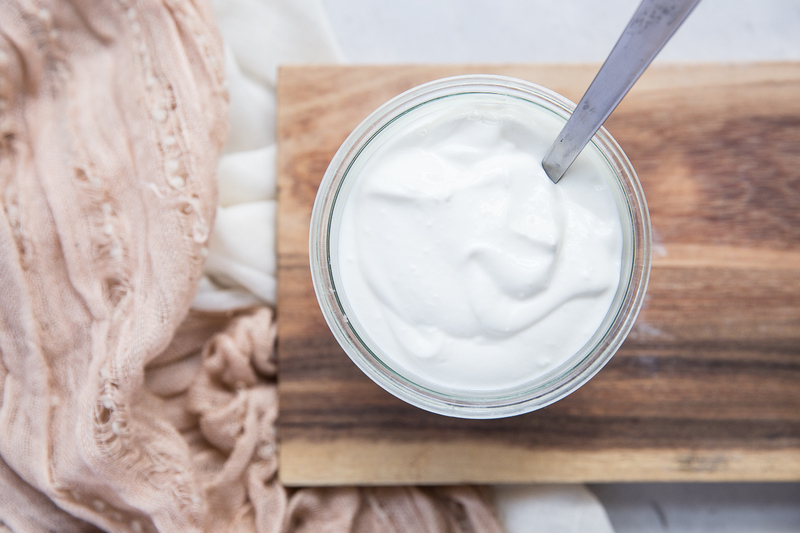 How do you make your own Greek Yogurt? • To make a batch of yogurt into Greek Yogurt it’s crucial to strain the yogurt for at least an hour. 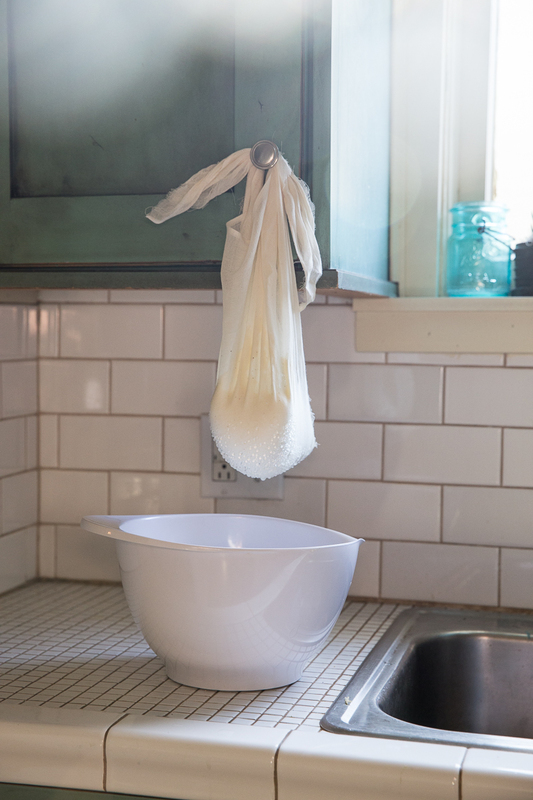 I use a cheese cloth or nut milk bag to strain it over a bowl (the nut milk bag is reusable so I like that best). I hang mine on a nob of my cabinet with a large bowl underneath to catch the whey. You can skip this step for a thinner more European style yogurt. How much yogurt does a half gallon of milk make? • A half gallon of milk makes almost 2 pints of Greek Yogurt (you’ll make more yogurt if you don’t strain it into Greek yogurt). What to do with the whey of homemade yogurt? • Many people keep the whey that is strained from Greek Yogurt as it has a lot of nutrients in it. If I’m not in a hurry, I save it and use it later as a substitute for liquids in baking (adds a sourdough flavor to pancakes or bread), add it to a protein shake or smoothie, use it to submerge cheese into, or use it as a starter culture to ferment veggies. How do you sweetened homemade yogurt? • There are two options for sweetening your homemade yogurt and I do it both ways. 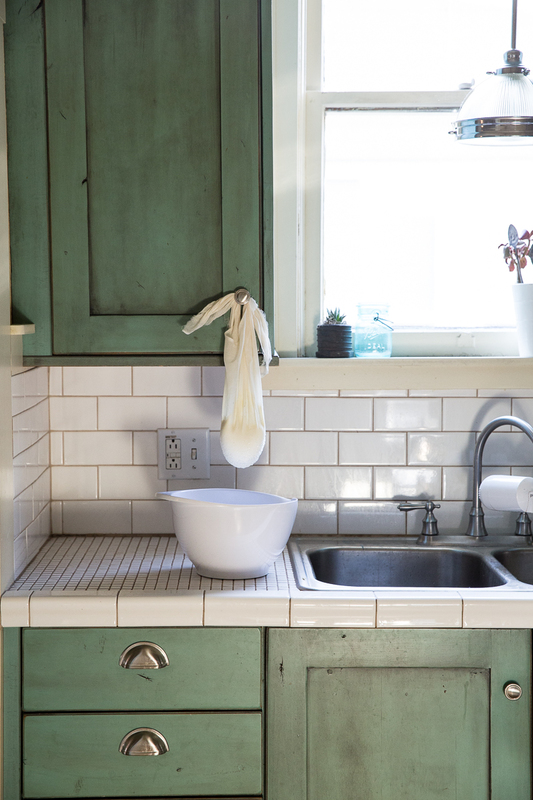 You can either stir in a sweetener (honey, vanilla bean, maple syrup or sugar) to the whole batch after you strain the yogurt and before you refrigerate, OR you can refrigerate and then sweeten it individually as you serve it. Serve the yogurt with jam swirled in or honey drizzled on top. The yogurt will be thicker the less you agitate it so if you stir in anything before refrigerating, just make a mental note of that. Also, if you are sweetening the whole batch I usually just guess at the amounts because I don’t sample the yogurt until after its been refrigerated overnight. 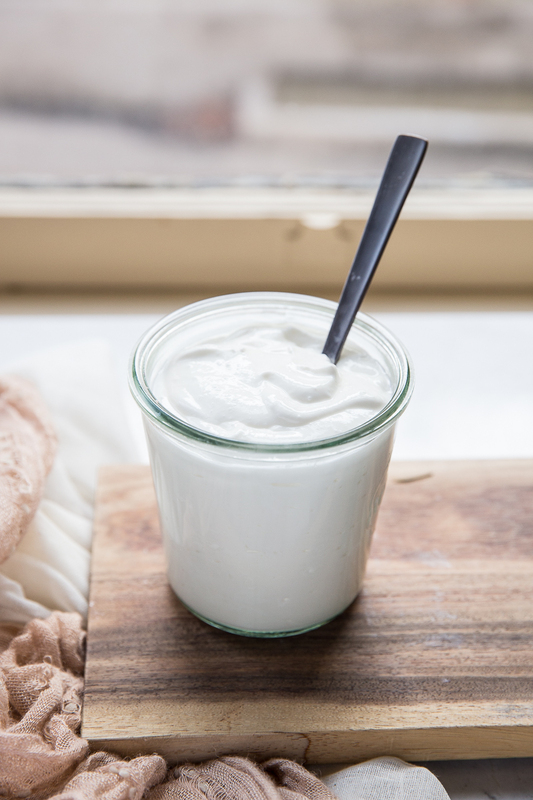 Do you need a yogurt culture or starter to make homemade yogurt? • You do not need a yogurt culture or starter to make homemade yogurt. You can add about 1/2 cup of plain yogurt to be the starter. I prefer using a starter because I feel like it makes for a firmer yogurt with more probiotic cultures. Oftentimes I will use a starter every other time (using the last 1/2 cup of yogurt from my last batch when I don’t use a culture). This will just save you more money and help make the culture that you buy last longer. I hope I answered all of your questions but please feel free to message me in the comments with any questions you have along the way. I think you’ll enjoy the wonderful treat of making yogurt at home. I promise it is so addicting that it may just become part of your weekly routine as it has for us! Here's a simple and fool-proof method for making Greek Yogurt in the Instant Pot. 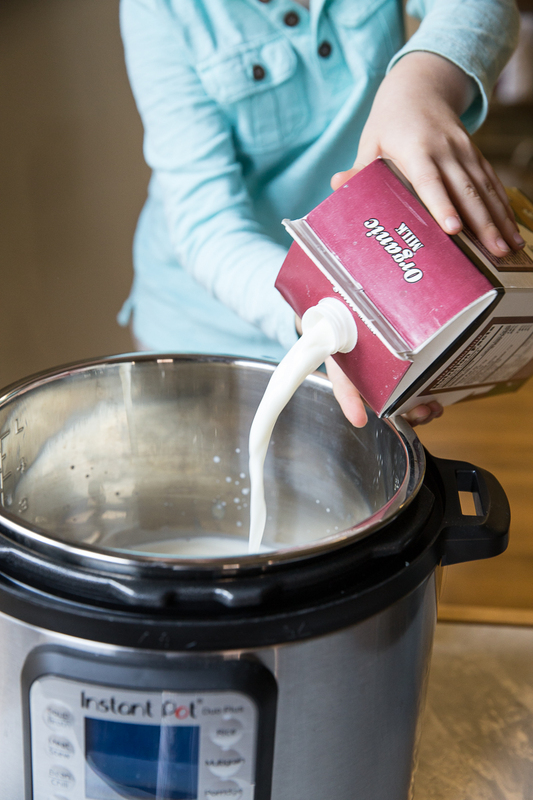 Pour your milk into the instant pot then press the yogurt button until you get to the boil function. It should take 20-30 minutes to boil. After the milk is brought to a boil you want to bring the temp back down to 112 degrees. Remove the steel inner pot from the instant pot. I either leave it out on the counter for 1 hour or refrigerate it for 40 minutes. You can use a thermometer to get a good read on the milk or just follow my times for cooling. 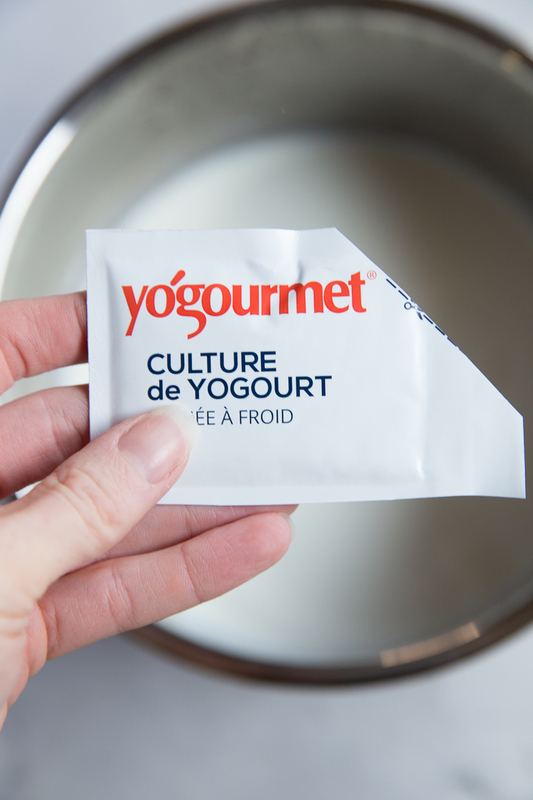 Stir in the yogurt culture and place the pot back into the instant pot. Turn on the yogurt button to 8 hours with the top on seal. After the 8 hours is up, pour the yogurt into a nut milk bag or large cheese cloth (double layer). Strain this over a bowl for 1 hour. Use a spatula to scrap the yogurt out of the cheese cloth or nut milk bag and back into the steel pot. Use a whisk to whip the yogurt and smooth it out. 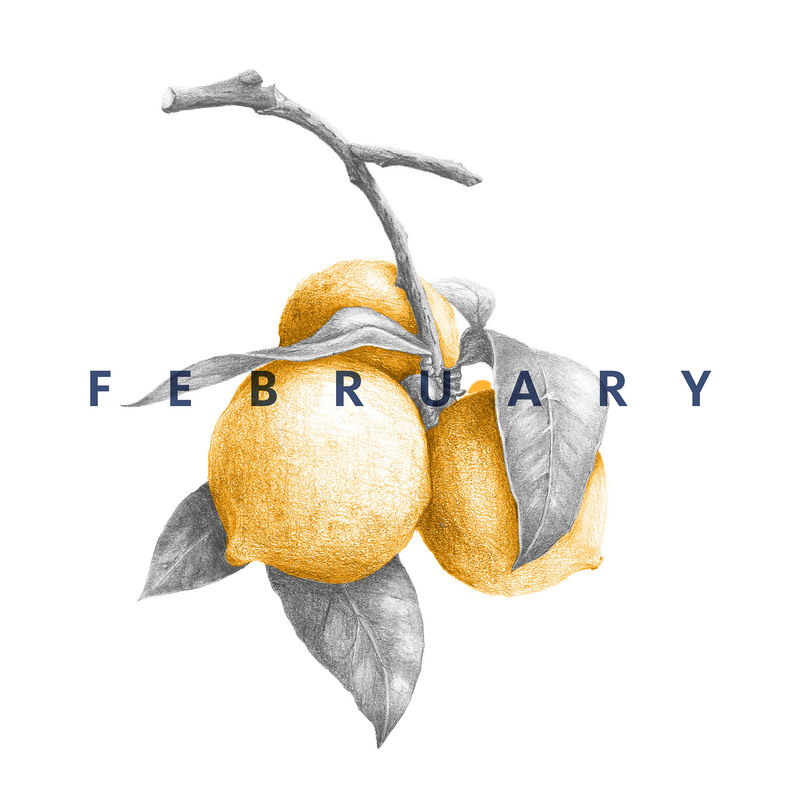 Now is the time that you can stir in any flavorings or you can leave it tart. Spoon the strained yogurt into a container with a tight lid. Refrigerate overnight before consuming. I'm using a half gallon of milk here because that's about the amount of yogurt my family will eat in one week. You can easily double this recipe and use a full gallon of milk. I still stick with one yogurt starter for a full gallon as well. The yogurt culture that I recommend here can be found on Amazon or Whole Foods. I’m looking forward to giving this a try soon! Oh I h ope you do Barbara! And I hope you like yogurt or someone at your house does because it makes a ton! I use the cold start method with Fairlife fat free ultra pasteurized milk. Do you know if I can use the powdered starter using this method? TIA for your help! I haven’t done the cold start method. I always bring it up to the high heat then cool before adding the starter.